I love Italian food. What makes Italian food so appealing to me is the philosophy behind Italian cuisine – a focus in highlighting local, in-season ingredients using traditional techniques that are executed well. When I heard that a new Italian restaurant was opening in King West, headed by Chef Luca Stracquadanio, formerly of Terroni LA, naturally I was excited. On Friday, November 14th, Nick and I had the pleasure of visiting the newly opened Ovest Cucina e Vineria. When you enter the restaurant, you immediately feel a sense of welcome. The light from the incandescent bulbs bouncing off the exposed ceilings and polished concrete floors gives the place a warm glow. The open kitchen is where you can observe Chef Luca and his team meticulously prepare their culinary creations. The walls are adorned with bottles of olive oil and wine. It’s a large space, and yet somehow it still manages to feel intimate. Looking at the menu, it’s not at all overwhelming, unlike other places where you simply have too many options. There are four sections – antipasto, pasta, pizza, and secondo – each of which has three to six choices. From the antipasto, we had three dishes. The Carpaccio di Pesce Spada – a smoked swordfish carpaccio – is one of Chef Luca’s signature dishes. With just the right amount of smoke, its buttery texture, and the tartness of the orange, this antipasto was absolutely delicious. The octopus carpaccio and grilled octopus were no slouches either – both were quite tender and flavourful, and beautifully plated. For the pizza, we had the Cacciatorino e Provolone. Pizzas are baked in the large stone oven right beside the kitchen. The crust was light and thin, as a pizza crust should be, allowing the Cacciatorino salami and spicy Provolone cheese to shine. For the secondos, we decided to be adventurous and try the dishes whose proteins were ‘game’ meats; in this case it was wild boar and rabbit. I had never tried wild boar, so I didn’t know what to expect out of the Costole di Cinghiale. To me, wild boar was kind of a cross between pork and beef. The shaved black truffle and seasoning provided the savoury notes, which juxtaposed with the sweetness of the butternut squash. The Nodini di Coniglio is a rabbit dish prepared two ways – a roulade whose filling consisted of Porcini mushroom and speck, and the rabbit front leg. The meat was very juicy, and the mushrooms gave that burst of flavour. The brussel sprouts and cauliflower puree were cooked perfectly. Having sampled six dishes thus far, we were full, but thankfully not overly full, as desserts were still to come. This to me says that our meal was quite well balanced, and not overloaded with heavy components. The first dessert that came was a traditional Sicilian cannoli. It’s not often I rave about a cannoli, but I really enjoyed this because of a shell that was perfectly crisp, and a filling that was silky smooth and with just the right amount of sweetness. The figs that accompanied the cannoli was a nice unexpected twist. A chocolate nest came next; this dish was absolutely stunning in its presentation. The nest was composed of hardened strands of chocolate, and it was topped with a rich, creamy chocolate mousse that was just firm enough in consistency to hold its shape. Just when we thought the chocolate nest couldn’t be topped, out came the Frangipane apple tarte. Each slice of green apple was shaped into a rosette, forming a bouquet that sat on top of a delicate, light, and flaky pastry crust. A touch of caramel in each rosette complemented the slight tartness of the apples. What’s more is that this was served with a delicious pistachio gelato on the side. With a cappuccino in hand, we were in dessert heaven. A quick note about the libations – Ovest Cucina e Vineria, as its name suggests, is not just a kitchen, but also a wine bar. With an impressive selection divided into the wine regions of Italy, there’s sure to be a wine that will suit your liking. Wines available by the glass are stored in an enomatic wine-serving system, ensuring the wines stay at their best, and are served at the perfect temperature. On weekends, you can sample charcuterie and cheeses from the in-house salumeria to pair with the wines. A variety of different cocktails is also available. We had a great dining experience at Ovest. 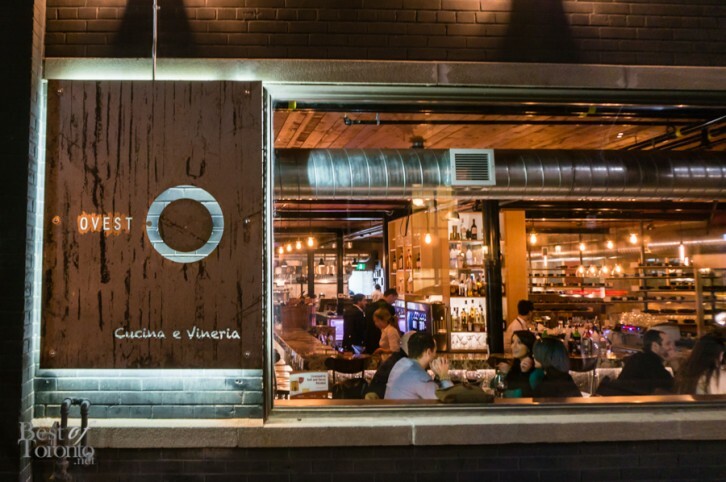 With authentic Italian cuisine that’s delicious, and excellent service and hospitality, it’s well worth a visit in King West. Ovest is located at 788 King St. West, between Niagara St. and Tecumseth St.